Have you heard of Francois Brunelle? He is a French-Canadian photographer best known for his ongoing project, ‘I’m Not A Look-Alike.’ The photojournal consists of pairs of completely unrelated strangers who look strikingly similar, in some cases almost as alike as twins. It is really quite remarkable. NOTE: My current doppelgänger seems to be Oklahoma City Thunder player Steven Adams. At least, that’s what people say. 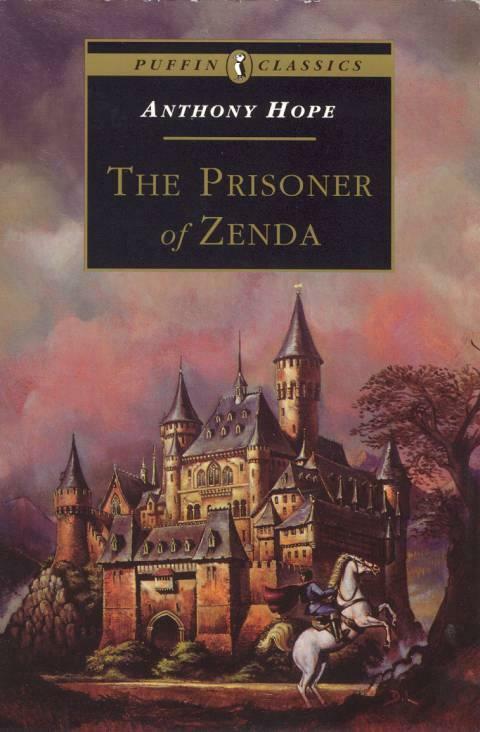 Anyway, if not for my familiarity with Brunelle’s work, I might find the premise of The Prisoner of Zenda to be completely fantastic and improbable. Instead, I come away from the book with a rather fond opinion; indeed, it’s one of my favorite reads in a long time. Thus, when he by chance crosses paths with the king-to-be the day before the coronation, dines with him, stays the night as a guest, and awakens the following morn to find his double drugged, Rassendyll has no choice but to undergo the coronation in the king’s stead. What follows is a thrilling, fast-paced, well-written tale that features memorable characters, action, romance and a very satisfying ending. 9/10. Highly recommended. There are a few components that make Zenda particularly enjoyable. First, the setting is charming. Hope’s story is placed in the mid-to-late-19th century, sometime after the advent of passenger railways in continental Europe. Rassendyll is seen traveling to Ruritania by train, and his chosen method of transport lends a somewhat modern air to the story. However, once the action arrives in Ruritania, the setting feels decidedly early-19th century, and in some cases even older. In Ruritania, trains are nearly forgotten for horses, and descriptions of castles, forests, moats, and raiment seem downright Victorian if not Stuart. So it would seem that Ruritania is a slightly overgrown land out of time, a place unfettered by modern conveniences and rather swashbuckling in comparison to the more sanitized locations without. Like I said, it is a very charming setting. I would say Hope’s Ruritania does for Zenda what the beauty of the Caribbean does for pirate tales – it provides a gorgeous backdrop that stirs the imagination and inspires exploration. Another interesting element of the book is the multi-layered plot. While the author focuses primarily on Rassendyll and his experiences, he also reveals glimpses of secondary and tertiary threads that serve to bring about the conclusion. Often, the reader is not made privy to every motive, emotion or cause of the extra-primary storylines; I prefer this, for by not spelling out the entire plot, Hope allows the reader to add another layer of the plot – his layer. When reading a book bereft of a fully-fleshed backstory, the reader can become more engaged with the story, imagining backstory for himself, filling in the unwritten gaps in whatever fashion he wants. We are set free to create storylines, build worlds, and conjure complex character backgrounds; this type of creativity is stifled by absolute descriptions and endless exposition. When an author leaves space for the reader’s imagination, as Hope does, I feel as though I am reading storytelling at its finest. The last component to address is language. The Prisoner of Zenda was published exactly six score years ago, so the text is flavored with words common in 1894 but that have fallen into disuse. Words like “poll,” “capacious,” “gaiety,” “vouchsafed,” and “derelictions” are just a sampling of the enjoyable English deployed throughout. Every time I encounter these and other (even more) esoteric words, it feels like a story within a story. What I mean is, there is historical weight in these terms. As Americans plunge ever more decidedly into vernacular influenced by text speak (U no wht I mean lol omg 4 realz), these old words stand like pillars of iron amidst a sea of ceramic. They will always have meaning, and though we may use them less and less, it makes them no less potent. Of this Zenda is a great reminder. Grant Stevens is the King of the Use Ironic Correctly Society, and he is THE professor emeritus of every great writing college ever. While not gracing people with his ever expanding oeuvre, he enjoys reading, watching movies, and eating breakfast tacos, especially from Soliz. I can’t wait to read this after reading this review!! !